Happy Monday! Late last night I returned from my brief trip to La Jolla for my friend’s wedding (check out my Instagram for photos!). It was such a blast to catch up with old friends from SMU that I haven’t seen in years and celebrate, but boy am I tired! You may remember this dress from this post in Carmel from last month. It was too chilly then for me to wear it bare-legged, but last week in Dallas the weather was too perfect not to pull it out again. This printed dress is super light and airy, making it wearable on even the hottest Texas days this summer. If you love this print, you should also check out the Barbara skirt, the Morgan skirt and the Gigi top. Some other pieces I’m eyeing from OTTE include this striped asymmetrical hem top, these snake-print silk pants, and this classic sleeveless blouse with a tie at the waist. This is such a cute casual look, love your new bag. So cute – I love how the chain detail on the sandals echoes the strap of the bag! This is a great casual look. Nice and light for spring. Those Chanel sandals are to die for! Such a perfect spring outfit. Love it! Love this outfit! It looks super comfortable! OMG those shoes are ahhh-mazing!!! Love this outfit! Oh he’s beautiful! I love Chanel boy bags! Perfect Spring look! Love how easy and comfy this dress looks! Amazing dress! Love the polkadots.. they’re almost leopard-esque! What a perfect outfit for the start of spring! I am all about comfortable, flowy and simple dresses. The black and white dotted pattern is just perfect, not one of those patterns that is too much but more exciting that just black. I can’t get enough of easy dresses like those! Love the print and how you styled it. Great look! I love your shoes and bag! That dress is perfection! Love love love! That dress is so pretty, love the more modern take on polka dots. And can we talk about those sandals?! Love!! Such a cute dress! Love something comfortable that makes an easy, put together outfit. This dress is incredible – gorgeous outfit. Love, love that Chanel Boy bag! I love this dress! 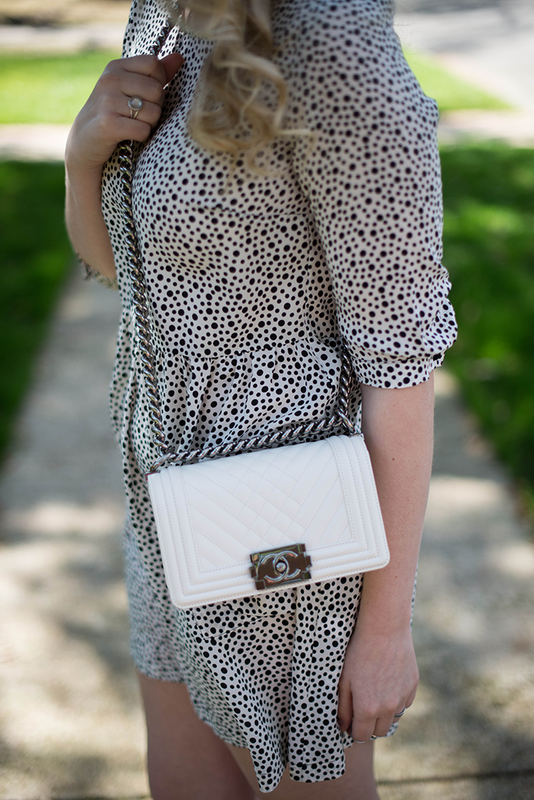 So perfect for spring :) That Chanel Boy bag – I must have it! Loving the white chanel, so classic! Hope you had a lovely weekend dear! THAT BAG. THOSE SHOES. If only we could combine wardrobes :) Great look, Merritt! Cannot wait to be bare legged more often! That boy bag is INSANITY!!!!! I love it so! And this dress is super cute! I love easy, comfy pieces like this. This dress is so lovely. You look amazing! I love how you made black and white so chic for spring! Love your little white Chanel bag! So darling! the dress is amazing. I have black spots on my mind lately. It is ideal for year-round. Dying over your sandals too. Adore this dress on you, very cute. LOVE this casual look. Your dress is perfect for a nice spring day.